In a short but fascinating interview, Silvio Danailov, Veselin Topalov’s manager and the President of the European Chess Union, shed light on the fate of a number of tournaments, his protégé’s form, and new and controversial plans for the future of chess. Danailov was talking to Yury Vasiliev for Sport Express. The interview was conducted while Danailov was in Georgia to negotiate holding the European Women’s Chess Championship this May in Tbilisi, after the acrimonious withdrawal of Turkey late last year. The event looks likely to go ahead, with the venue the 5-star Sheraton Hotel in Tbilisi, a prize fund of at least 100,000 euros, and sponsorship from Azerbaijan’s SOCAR oil company (whose President, Mair Mamedov, is Vice President of the Azerbaijan Chess Federation). The career of your protégé, Veselin Topalov, has been on the decline recently. 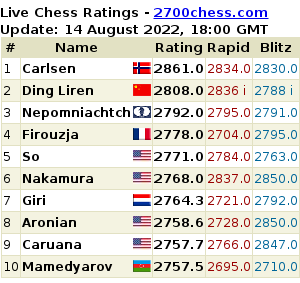 He’s dropped from first place on the rating list to 7th, and hasn’t played at all for a long time. Is that connected to his marriage? Yes, of course you become a little more relaxed in life after marriage, as everyone knows. But it’s much more important for Veselin to find new inspiration. That’s the most difficult thing for a sportsman who’s been at the top, played two World Championship matches, won a huge number of tournaments and headed the rating list for 18 months. Real motivation can only come from a match for the world title. How do you rate Topalov’s chances in the Candidates Matches in Kazan? Veselin will prepare for them seriously, and if he’s as well prepared as he was for the match against Anand, then he’ll be one of the main favourites. I hope we’ll see the old Topalov in Kazan! But nevertheless, what will happen if Topalov and Kramnik meet in the final? You’re the director of the M-Tel Masters super-tournament. Five tournaments went brilliantly, but what about the sixth? Our tournament usually takes place in May. 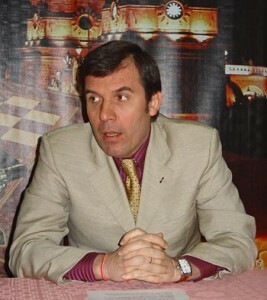 Last year, its dates clashed with the Anand – Topalov match, while now they coincide with the Candidates Matches in Kazan. Next week I’m meeting the management of M-Tel, and I hope that the tournament can be held later this year. You’re friends with the mayor of Linares, Senor Gutierrez. Will the famous Spanish Linares tournament be taking place this year? In the past Linares often had problems inviting top-grandmasters, as some of them didn’t want to play Wijk-aan-Zee, Linares and Monaco one after the other. Now it’s been announced that the Monaco tournament is being held for the last time. Therefore next year Linares will return to its normal position – March, while this year it’ll be held in October. I recall during the 3rd M-Tel Masters tournament you told me something that stuck in my mind for a long time: “Chess should either change, or die. There’s no third option”. Now, as President of the European Chess Union, the ball’s in your court. How, in your opinion, should chess change so as not to die? A few things need to change. Firstly, Sofia Rules should finally be introduced into all tournaments, so there are none of the 14-move draws we’ve seen in a series of events. And if there’s a deliberate three-fold repetition in a position where it’s still possible to fight, the arbiter should penalise the players with a zero on the score table. Secondly, the football points system used in Bilbao and London – three points for a win, one point for a draw – should be introduced everywhere. And finally, we need to reduce the time control. A game should last no longer than four hours. The 30 seconds a move increment (and any increment in general!) should be abandoned. That’s essentially deprived fans of the enthralling spectacle of time trouble. In addition, all tournaments need to be placed on a commercial footing. We can’t allow all sorts of sites to steal the text of games or “pictures” from the organisers, who’ve spent money on all that. All of us: organisers, players, trainers and journalists should realise that chess, in order to survive and develop in the world as it is nowadays, has to be stricter and more professional. ah, always nice to read his crap. Immune from irony, the architect of Toiletgate, lectures us on what is in the best interests of chess. While he’s at it, this supposedly neutral head of the European Chess Union can’t manage to disguise his hostility toward one of Europe’s best players, Kramnik. Why? Because the former World Champion was the innocent target of Danailov’s trumped up cheating allegations, and the whole sordid affair blew up in Danailov’s face while the whole world was watching. He obviously is immune from shame as well…. wow, I didn’t know Topalov was married. I hope his decline never stops and the whole Danailov mafia gets eradicated from the chess scene forever. Geez, this douche again. I thought I’d give him the benefit of the doubt and read what he has to say, then he comes out with: “The 30 seconds a move increment (and any increment in general!) should be abandoned. That’s essentially deprived fans of the enthralling spectacle of time trouble.” What a clown.